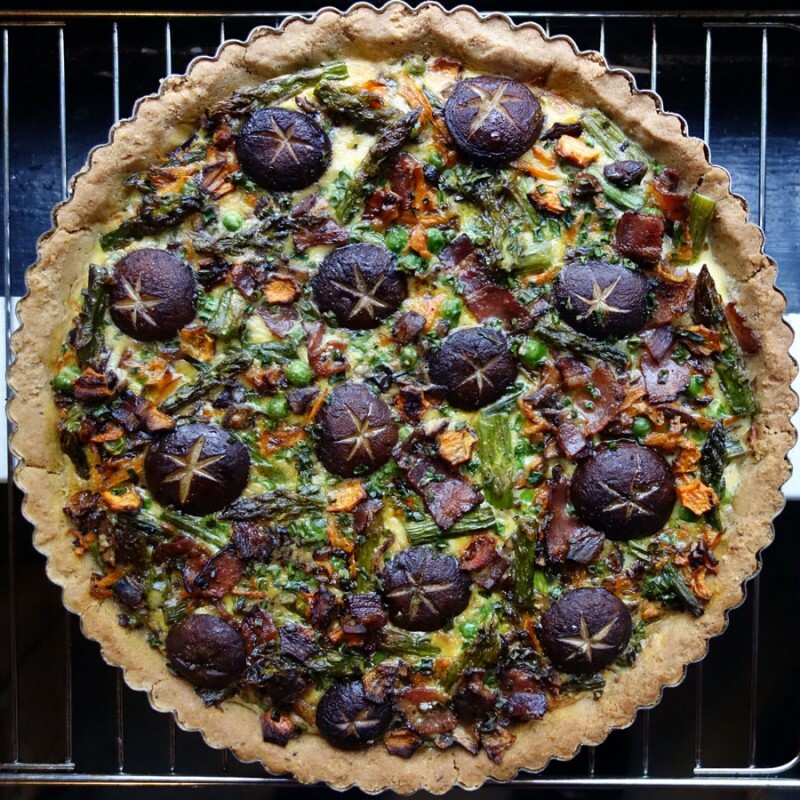 “Pssst… Your tart was the best thing on the table.” Normally, I wouldn’t be bragging someone whispered this to me about the Roasted Asparagus, Mushroom, Bacon and Cheese Tart I made for a New York Women’s Culinary Alliance potluck last week. But the person to who said it was the former owner of one of the finest bakeries in New York City. Plus, I’d almost threw the tart in the composter early that day. Who remembers the 1969 Alka Seltzer commercial? Mama Mia! That’s A Spicy Meatball. 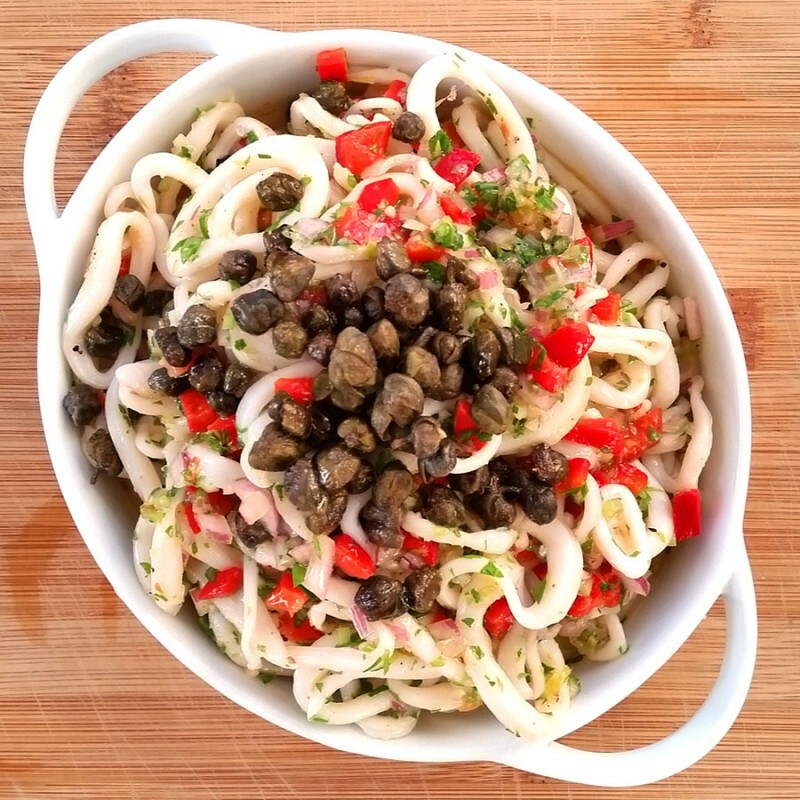 On Saturday, the plan was to remake the spicy calamari salad, I’d made the previous Sunday because the original would not have given the guy in the heartburn. It lacked kick. 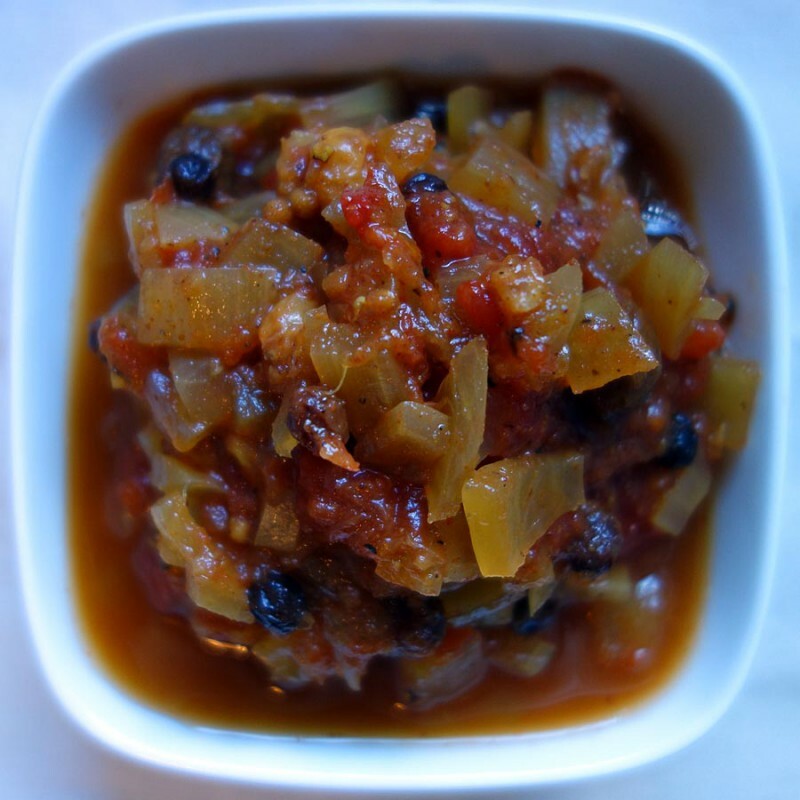 I’d also served it cold and I thought it would be better warmer on the temperature side and the Scoville scale side. Do you remember the time I got a little over-excited about a dessert for Easter after seeing and tasting the Merveilleux at the Aux Merveilleux de Fred shop on 8th Avenue? Yes, that was just this past weekend. 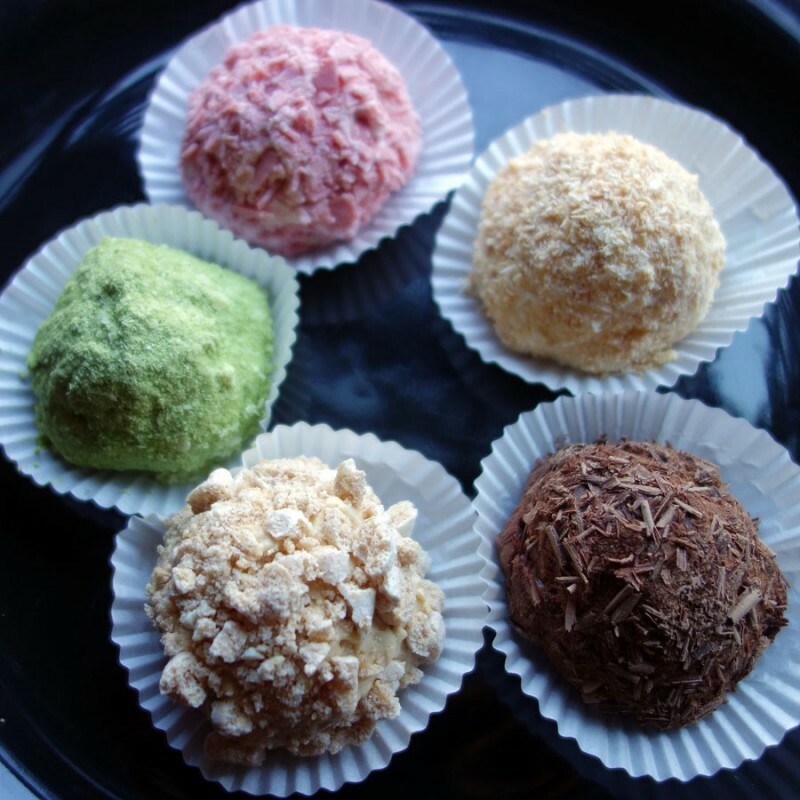 Let us not count the hours it took me to come up with and make an assortment of five completely different flavors of Merveilleux. Suffice it to say it was a lot and it is out of my system… for now. Merveilleux are light, gluten free pastries made of meringue discs sandwiched and smothered with Bavarian cream and rolled in a coating of chocolate, meringue, nuts, etc. Apparently, according to one my less-than-mature male friends, mine looked like boobies. Boobie cakes. I think that may give them even more appeal. Merveilleux translates from French into Marvelous or Wonderful. I call them “Wonderfuls” because they are. An eyeglass store is not the first place you’d think you’d find cooking inspiration. At the Warby Parker stores, you can buy books from small presses, in addition to eyeglasses, but I didn’t notice any cookbooks. 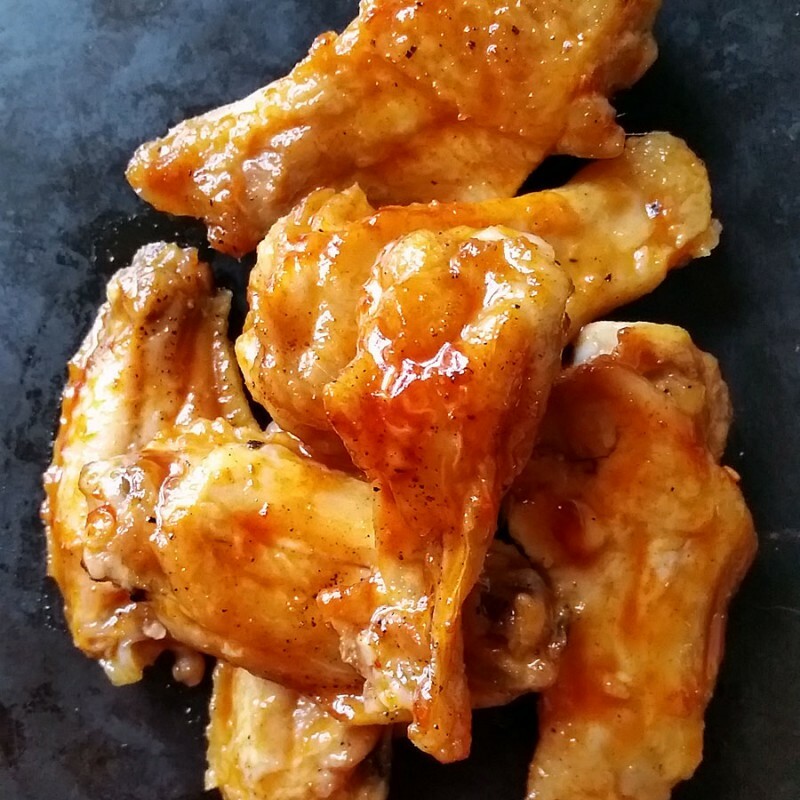 This recipe for Sriracha Honey Lime Glaze for my Cooked The Sh*t Wings was inspired by an event at the store on Washington Street. It was for a book that 826NYC and Edible Schoolyard helped produce, filled with stories by New York school kids called “Chicken Makes the Ice Cream Taste Better”. C-R-U-N-C-H!!! has to be one of the most satisfying sensations in your mouth. 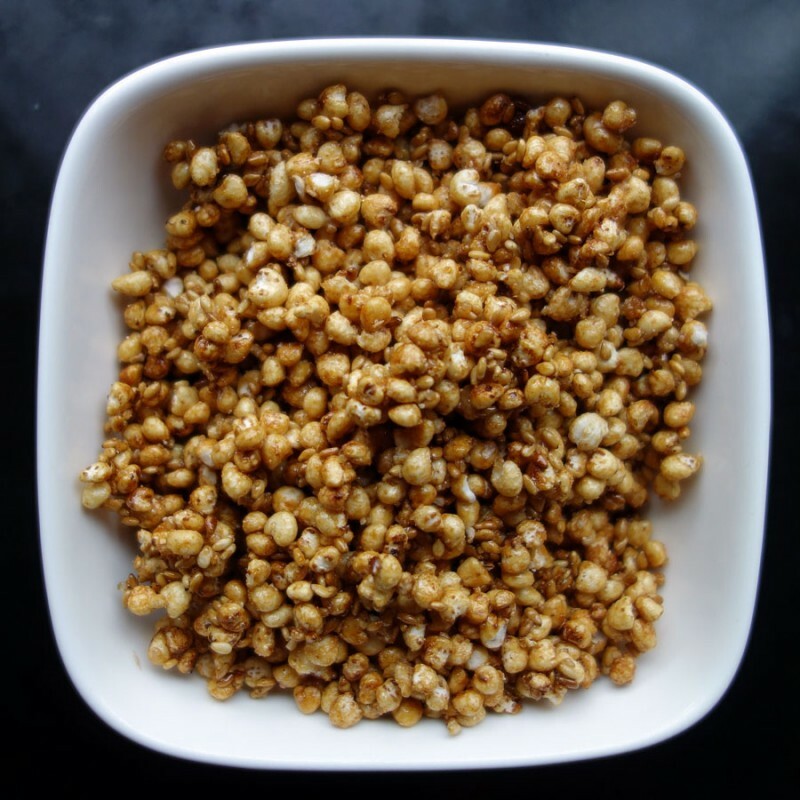 Caramelized Millet Puffs add a little sweet, crunchy texture to desserts. You can also sprinkle them on French toast, oatmeal or granola. I was asked to participate in a Get Baked Google Hangout Online show about pies because I’ve co-produced the event Pie Party Potluck LIVE for the past few years! My theory is it’s best to talk about pie when you’re eating pie so I had to make pie. What to make? 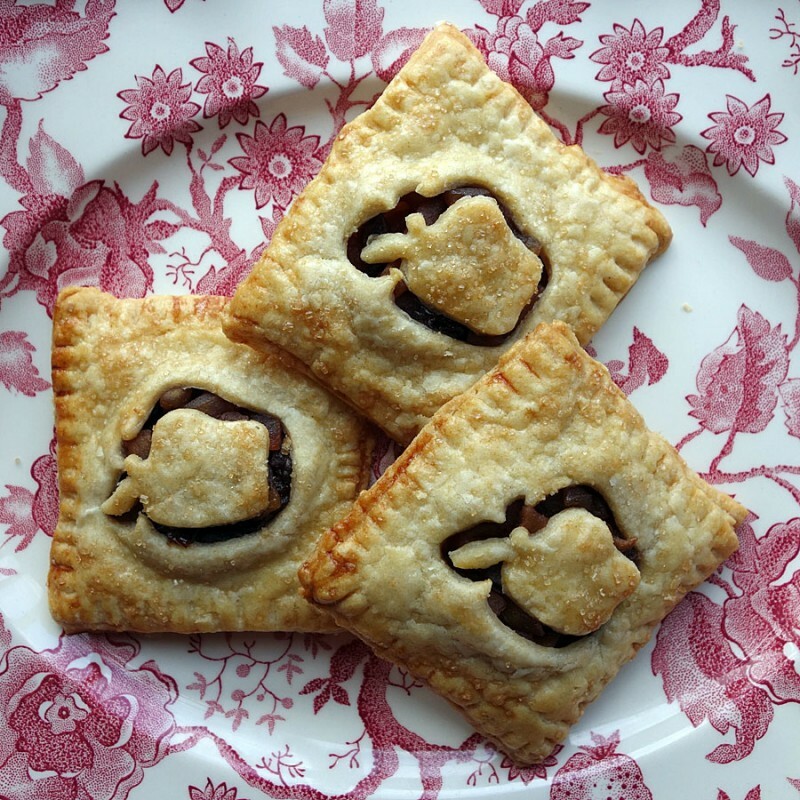 I settled on Apple Cherry Ginger hand pies because they bring the CUTE! 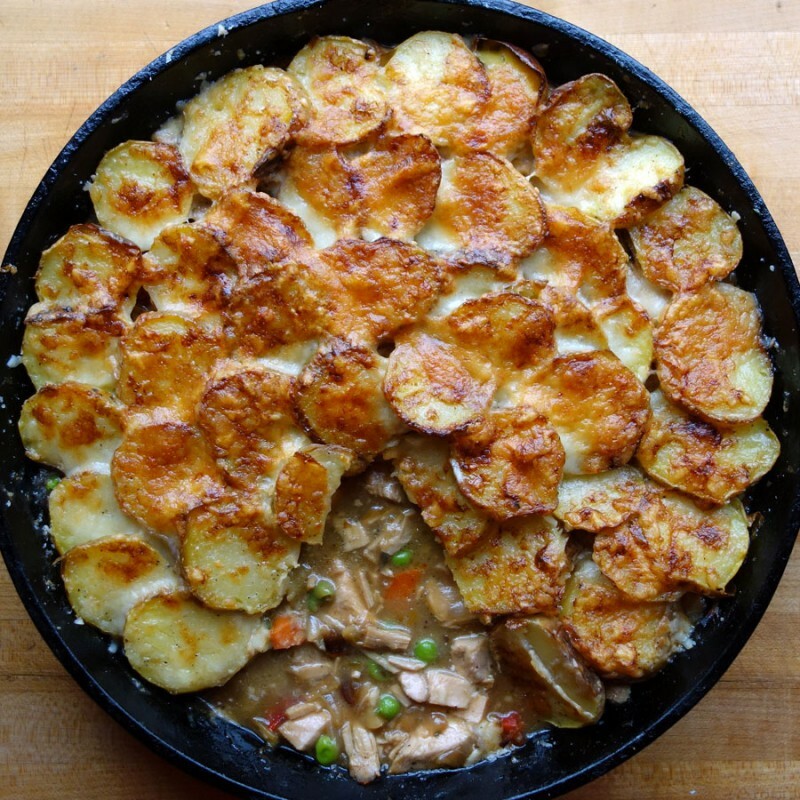 If people have to look at a pie that they don’t get to eat, it’s wise to make them adorable. Do you ever want to just smash something? When I was a little girl I was rather partial to a temper tantrum. I’d get so angry, I’d simply want to throw things and hear them smash. There is something so satisfying about the sound and it’s a nice way to get one’s aggression out. Are you angry about the never-ending winter or the coming of spring? 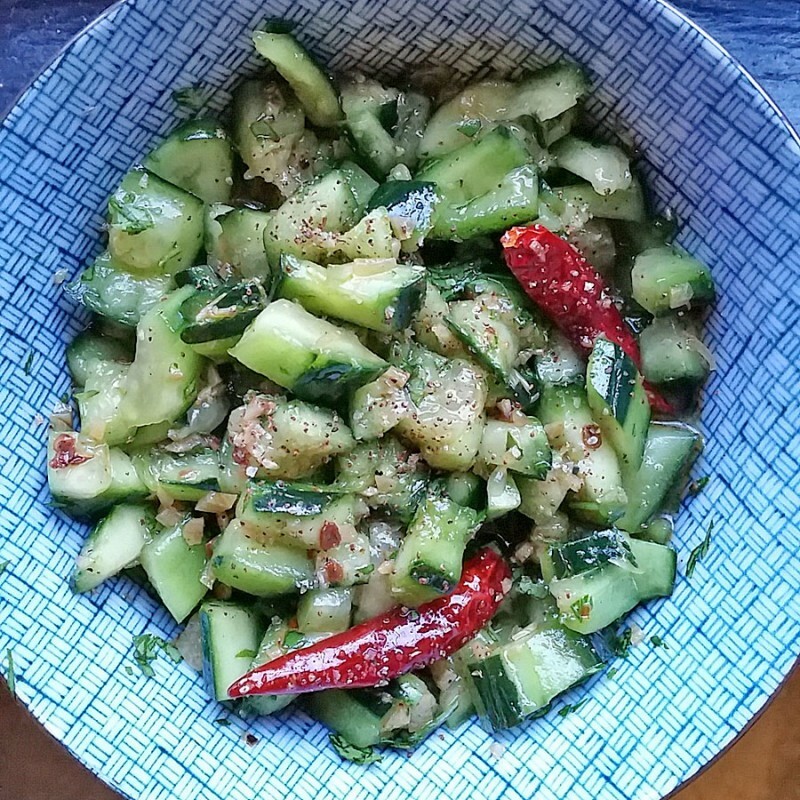 You can take your aggressions out on the cucumbers in this salad… they don’t seem to mind. 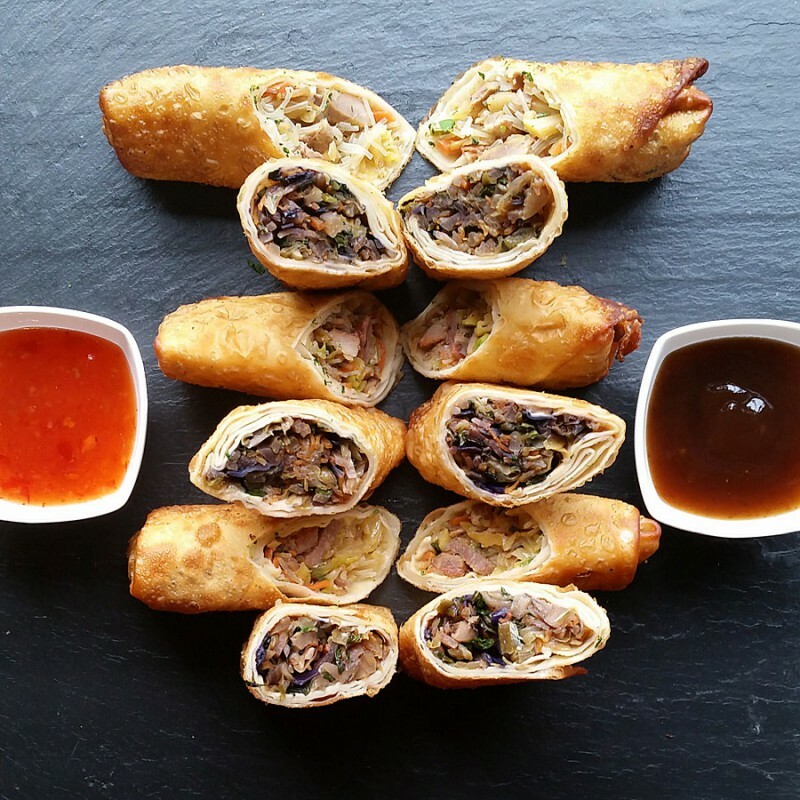 There was a time when you had to have egg rolls on the menu in New York Chinese restaurant like it was the law of the land. These days, I have to hunt them or make them.